Let’s talk about the advantages of down rigging. Use your sounder to determine the depth you will be fishing, and more importantly, that your target species will be holding. Set fresh live bait in the strike zone with the downrigger, ensuring that there are several meters between the downrigger clip and the leader, so as to not deter any fish. Most downriggers will have a counter which shows how deep your bait has travelled. The weight of the downrigger will hold a consistent depth measured on the counter in the water column allowing you to be precise when setting baits. Using a downrigger, it is possible to fish almost straight up and down whilst covering good amounts of territory, slow trolling baits. Downriggers incorporate a break away system from the weight and the baited line. Therefore, anglers have far less line out than if you were to simply use a sinker attached to the main line, including minimal resistance in which the fish could spit the bait. Less line in the water means that you have already improved your chances of landing the fish and not getting smoked.We try to use two downriggers at a time, setting one closer to the bottom, and the other mid-water, so that we can cover all bases. Also try to mix up the baits that you are using, e.g. one Slimey and one Yellowtail, ‘Yakka’. 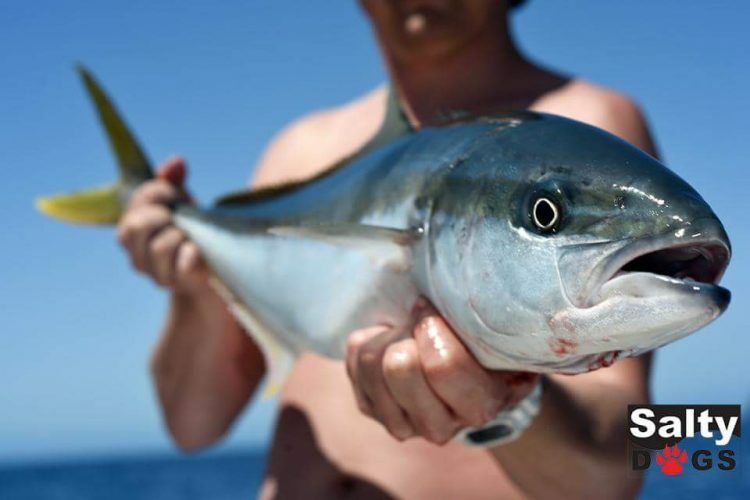 Even though Slimeys are generally considered the preferable bait, there are times when if the fish are feeding on something else, like ‘yakkas’, then they may reject anything else. 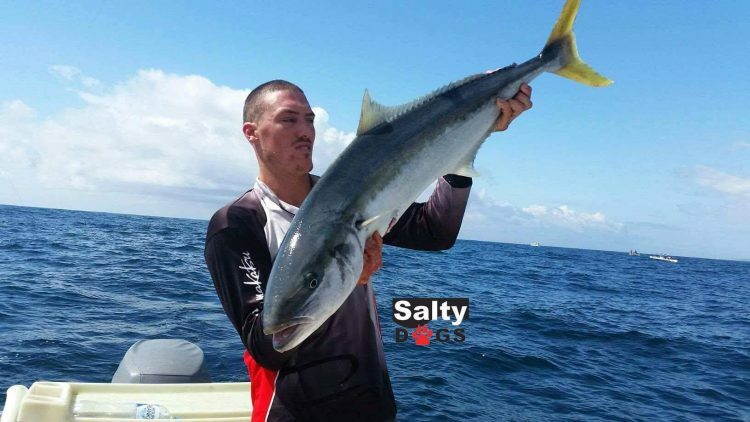 In the past few weeks we have been catching solid Kingfish using this technique around the headlands and respective reefs off Sydney. The images provided are evidence that knowing exactly where your baits are is a fantastic way of improving your chances of catching. We have been using the Xtracta POP rods in the 50-80lb size, so that we can use increased pressure on larger fish. One particular day we ran into some smaller Mako Sharks feeding on a bait ball. We were targeting Kingfish, but ended up shark fishing using the exact same technique. 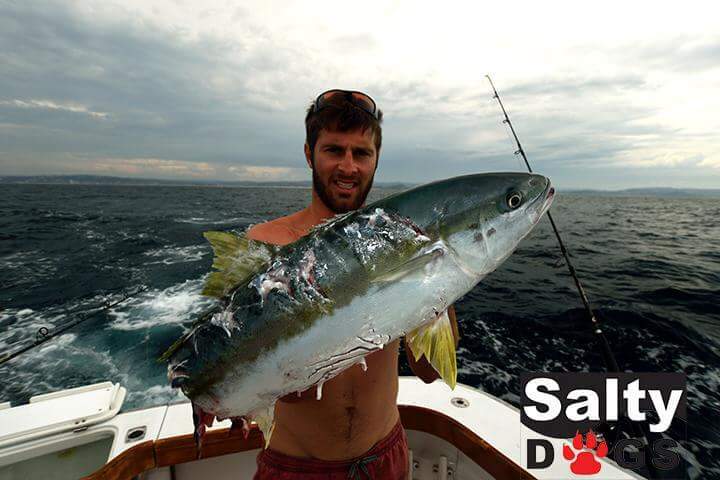 By slow trolling the baits it meant our hook up rate was generally in the corner of the jaw of the sharks, allowing the Gamakatsu live bait hooks to show their worth.